Long before a certain Wayne Rooney broke the long-standing goal scoring record at Manchester United it was held by another Englishman regarded as one of the best of all time. Sir Bobby Charlton was heralded at Old Trafford for his dedicated service to the club and also held in high esteem by English fans given his prominent role in helping The Three Lions win their only World Cup title till date on home soil back in ’66. The balding English Knight is now seen regularly in the stands at Old Trafford, still in love with the club he has served meritoriously even in retirement. 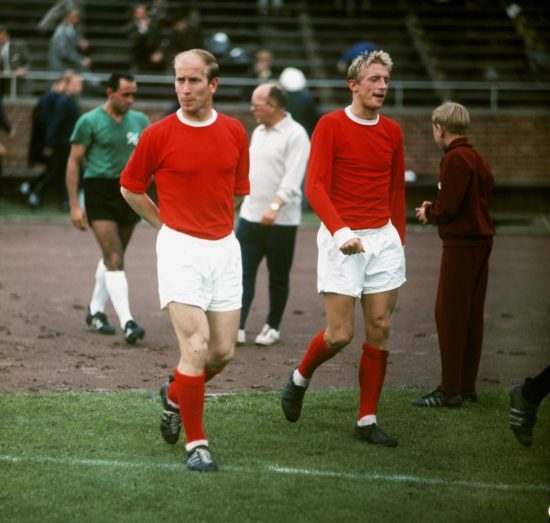 Part of the Holy Trinity that consisted of the likes of George Best and Denis Law alongside him, Charlton was regarded as the least glamorous of the trio. Best was a ladies delight, an absolute genius who played for the game and was as naturally talented as any other player in that era while Law was the Scottish darling with his flowing locks and insatiable appetite to score goals. While the two were exceptional, Charlton trumped them both for his dedication, drive and commitment to the club. Part of a famous footballing family with his brother, Jack, Bobby, real name Robert survived the Munich Air Disaster of ’58 that saw the club lose key players and threaten to be on the doldrums forever. A decade later, he was helping United win our maiden European Cup against a Benfica side led by perhaps the greatest European striker of all time, Eusebio. While diminutive defensive midfielder, Nobby Stiles consistently harried the Portuguese legend off the ball, Charlton was effective further forward, scoring twice in a memorable 4-1 victory and helped launch United into a global force we are today. A United man through and through, Charlton exemplified everything the club holds dear: fight, courage, discipline and success and is a role model the club’s players can always emulate. Sir Alex Ferguson utterly respected him and his appearances record is only bettered by Ryan Giggs, who achieved the honour in the 2008 Champions League final victory over Chelsea in Moscow. It is not an uncommon sight to see Charlton grinning widely when United score a goal, as he would do anything for the club. 249 goals in 758 matches for someone not an out and out striker speaks volumes. We are fortunate to still have him at the club, and long may his name be sung at Old Trafford, especially in the Sir Bobby Charlton stand, a worthy honour for someone who gave his all for our glorious club.